More than just a place to tell especially clever jokes on a warm and bright afternoon afternoon (and for once the weather was actually warm and bright), the Whitsundays are a collection of over 90 islands sitting off the coast of Australia. And though detached from the mainland, they are arguably one of the most beautiful parts of the country. And Kirsty and I were going to be spending 2 days sailing among them, snorkeling, and enjoying one of the world's top-rated beach. But I'm getting ahead of myself. We didn't board the boat until 2:30 that afternoon, so we rented some bikes and pedaled around Airlie and the coastline. We also stopped at the Shark Hunter's lair/museum for a rather large jaw dropping look at sharks in Australia and an interesting perspective. And then, at last, we were on the Atlantic Clipper heading for paradise. Within minutes of raising anchor, a loud chorus of people echoed from below, "12, 11, 10, 9... tree, two, one!" That's no typo. The Irish weer (that IS a typo) belowdecks and knee deep in drinking games, and sir/madam, there were a lot of them: half our 40-person group, in fact. Also aboard were two nice Canadian girls, particularly Emily from Victoria who had great taste in music and as such, a lot in common with me, a Calgary boy who really lives up to the Alberta stereotype, three really friendly English blokes that Kirsty befriended right away, and most importantly, two brothers from Kansas representing the best country in the world as they liked to amusingly remind us. We anchored for the night in a bay separated by a small strip of land from Whitehaven Beach, had a potato dinner (probably inspired by the Irish quotient) and got to sleep early. We were the first ones to get to Whitehaven the next morning and got some nice high-tide photos with not a soul to be seen. Kirsty and the English lost patience with my photographic philandering and were gone across the tidal pools by the time I arrived, so I took my camera and philandered some more. It was absolutely beautiful, sparkling white sand in tiny islands, perfect blue water, no photo was a bad photo in this place. I even got what I consider to be one of the best photos I've ever taken in my life of the little soldier crabs marching along the beach to the shore and a small palm-fringed island sitting on the slightly skewed horizon. Then I put the camera away and enjoyed all these things without a lens in front of me. Kirsty and I left a little early and got some even nicer low tide photos of Whitehaven before heading off to lunch and our first snorkel. The water was surprisingly chilly which was unexpected, but the reef was in really good condition (considering the millions of tourists tramping through here) so the surprises canceled each other out. Most of the afternoon was spent lounging on the sundeck, then another snorkel, dinner, and Kirsty went to bed while I worked on my photos and blog for a while. Then I joined the festivities upstairs and was impressed by the hoola olympics briefly before going to sleep myself. The next morning and it was already our final day on the Clipper. Neither of us were remotely ready to trade our free-wheeling sailing lives back for the open road and get off the boat, but we did anyway. Not before a morning snorkel, however, and getting to know a few more of our fellow passengers a bit better. Particularly, the American boys, Matt and Dan, who we invited to come along with us since they were headed the same way. 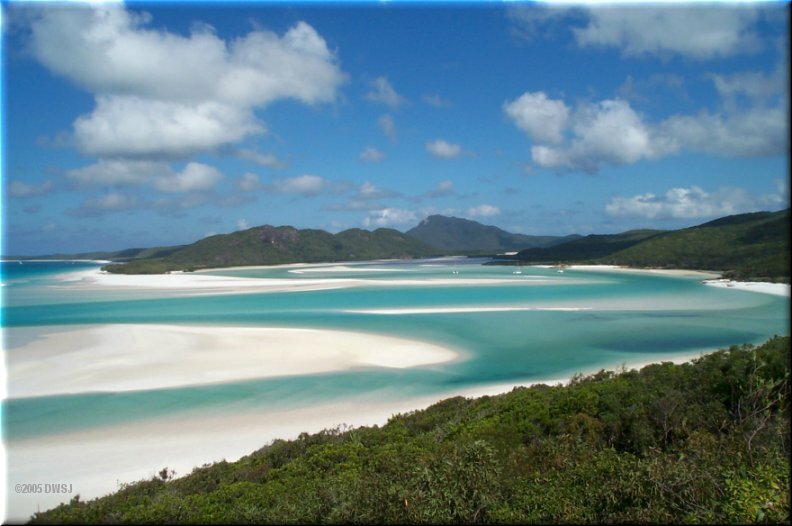 When we got back to Airlie we were hoping to do some kayaking or something of that sort and then found a deal for Hamilton Island that night which not only put us back on the Whitsundays but also included a nice hut and all sorts of beach activities. We were on the ferry there one hour later.